What Does The Term Mystery Mean When Used In The Bible? What does the word “mystery” mean when used in the Bible? Why is it important for us to know? If you’ve read any type of mystery novel before, you should know that a mystery novel is a story that has the truth hidden within the mysterious group of facts. The facts are often revealed piece by piece until the mystery has been revealed and you can find out who did it (whatever “it” is in the story) but it’s not usually until near the end of the book but God doesn’t have us wait to reveal what’s been hidden and a great mystery to the world because He reveals Himself in the Person of Jesus Christ and Christ reveals what the gospel is, and how a person might be saved. Even so, the word mystery is used quite often in the Bible and particularly in the New Testament so what is this mystery? 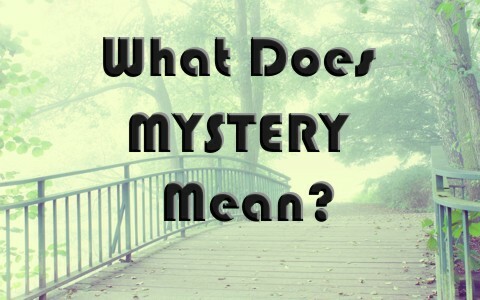 Why is it called a mystery and what’s so mysterious about it? The Prophet Daniel was the only author in the Old Testament that wrote about a mystery in regards to King Nebuchadnezzar’s dream and he wrote that “the mystery was revealed to Daniel in a vision of the night. Then Daniel blessed the God of heaven’ (Dan 2:19) and said “No wise men, enchanters, magicians, or astrologers can show to the king the mystery that the king has asked” (Dan 2:27). He went on to tell the king that “this mystery has been revealed to me, not because of any wisdom that I have more than all the living, but in order that the interpretation may be made known to the king, and that you may know the thoughts of your mind” (Dan 2:30) and this mystery was not revealed by Daniel but the “great God has made known to the king what shall be after this. The dream is certain, and its interpretation sure” (Dan 2:45) so King Nebuchadnezzar said, “Daniel, “Truly, your God is God of gods and Lord of kings, and a revealer of mysteries, for you have been able to reveal this mystery.” Then the king gave Daniel high honors and many great gifts, and made him ruler over the whole province of Babylon and chief prefect over all the wise men of Babylon” (Dan 2:47-48). Daniel knew it and now King Nebuchadnezzar knew it; that God alone can reveal a mystery concerning Himself, the latter days, dreams, visions, and for that matter, the gospel of Jesus Christ. Paul wrote to the church at Rome that “Now to him who is able to strengthen you according to my gospel and the preaching of Jesus Christ, according to the revelation of the mystery that was kept secret for long ages” (Rom 16:25) but what was this mysterious thing that God has “kept secret for long ages?” It was the fact that what had been hidden “has now been disclosed and through the prophetic writings has been made known to all nations, according to the command of the eternal God, to bring about the obedience of faith. Even the Book of Revelation refers to a mystery that’s been hidden up till now, during the age of grace. This was hidden from the eyes of those who refused to believe” (Rom 16:26). Mystery solved. The mystery that was long hidden was the gospel of grace but it was not hidden to everyone because “Noah, being warned by God concerning events as yet unseen, in reverent fear constructed an ark for the saving of his household. By this he condemned the world and became an heir of the righteousness that comes by faith” (Heb 11:7). Noah was warned because “he did all that God commanded him” (Gen 6:22) and so did Abraham who “believed the LORD, and he counted it to him as righteousness” (Gen 15:6). Obedience to God is accounted as righteousness to God because they believed Him. To believe is to obey and do what He tells us to do and today, that’s the command to repent and believe the gospel, which is exactly what Jesus very first words were when He started His earthly ministry (Mark 1:15) and Peter’s answer to the crowd who had asked, “Brothers, what shall we do” (Acts 2:37) was for them to repent. Paul being an expert in Scripture knew that “the just shall live by faith” was found throughout the Old Testament (Ezk 18:9; Hab 2:4) for even Abraham “believed the Lord, and he counted it to him as righteousness” (Gen 15:6). Do we initiate our own salvation or does this call come from God? Paul wrote to Timothy about who it is that grants repentance; we or God? In 2 Timothy 2:25 Paul answers that by writing that “God may perhaps grant them repentance leading to a knowledge of the truth” (2 Tim 2:25). Earlier, Paul asked the church at Rome the rhetorical question; don’t you know “that God’s kindness is meant to lead you to repentance” (Rom 2:4)? Jesus reminded the disciples that “You did not choose me, but I chose you and appointed you that you should go and bear fruit and that your fruit should abide, so that whatever you ask the Father in my name, he may give it to you” (John 15:16) perhaps as a way to keep them humble, having the proper perspective as to Who did the saving, and hint; it wasn’t from us (Eph 2:8-9). Jesus says elsewhere that “No one can come to me unless the Father who sent me draws him. And I will raise him up on the last day” (John 6:44) and “no one” is universal in the Greek language that no human can possibly come to Jesus unless the Father draws him (or her). The Greek word for “draw” is a lot stronger in the Greek (“helkō”) and actually means “to drag, to draw,” and “to impel” and was the same word used when Paul and Silas were “dragged” (“helkō”) them into the marketplace for a quick trial and punishment (Acts 16:16-40). For a time, the gospel was a mystery to Paul so he was persecuting the “mystery of the gospel” but even that’s part of the mystery. Paul didn’t really know what he was doing. Little did he originally know that it’s the gospel of repentance and faith that Jesus taught (Mark 1:15) and it is also the fact that God is the One Who has called us and has chosen us (Eph 1), not the other way around (John 6:44). Just as it was for you and for me, it was for Paul that “the mystery was made known to me by revelation, as I have written briefly” (Eph 3:3). Paul didn’t “figure it out” but says “the mystery of Christ, which was not made known to the sons of men in other generations as it has now been revealed to his holy apostles and prophets by the Spirit [and] this mystery is that the Gentiles are fellow heirs, members of the same body, and partakers of the promise in Christ Jesus through the gospel” (Eph 3:4b-6). We too are called, just as Paul was, “to preach to the Gentiles the unsearchable riches of Christ, and to bring to light for everyone what is the plan of the mystery hidden for ages in God who created all things, so that through the church the manifold wisdom of God might now be made known to the rulers and authorities in the heavenly places” (Eph 3:8b-10). Maybe we’re not called to be an evangelist, or preacher, but we’re all called to proclaim the gospel to the entire world (Matt 28:19-20; Acts 1:8) but not to the extent that we overlook those who live next door. Hello Jack, I don’t understand something. If we’re not all called to be preachers or evangelists, how can we proclaim the Gospel? And if we do proclaim the Gospel to someone we’re automatically preaching/evangelising. Am I missing something? Hello Friend. To evangelize or witness is not the same as preaching. Preaching verse by verses is not the same as witnessing to the lost from Scripture. Pastors are offices called to feed the flock and to equip the saints, but just because we share Christ doesn’t mean we are called to preach. God calls and places in the Body where it pleases him and obviously not all can be evangelists or preachres. Previous post: What Five Principles Should Pastors Consider to Fulfill Their Purpose?